To save his job, the 27-year-old salesman Rajiv has to sell 1 water purifier by Friday. Manchanda, the crazy, quirky guru of crash courses in sales, gives him a lead of a possible customer. 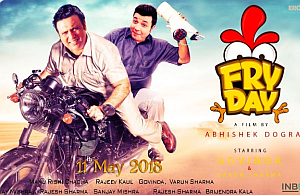 Rajiv thus heads for the house of the popular theatre actor Gagan Kapoor, who is actually a loving husband but at the age of 40, a man with a series of extra-marital affairs. And on that Friday, as Gagan gets naughty with Bindu, in enters Rajiv who refuses to get out because he has to, has to install that damn purifier. Gagan wants him OUT because his wife is expected anytime soon. Rajiv uses the tips from Manchanda to indulge into extra-sweet-sugar-talk with Gagan and Bindu, and when Gagan’s wife enters, and then later Bindu’s eccentric cop husband, Rajiv finds himself in varied relationships with each person, just to install that Pavitra-Pani-Purifier, while Gagan pleads with him to keep his dalliances a secret. What plays out is a hysterical comedy on that Friday that is no less than a FRY-DAY.